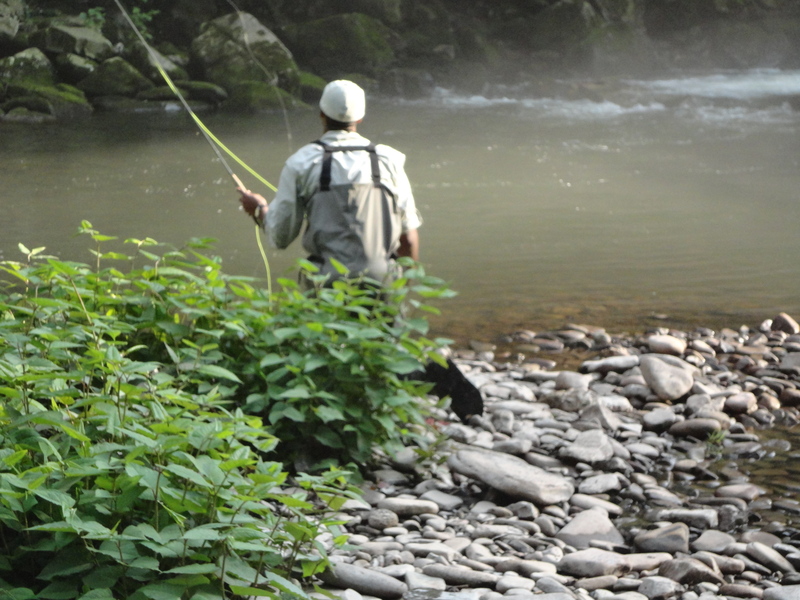 My brother and I decided to do a fly fishing trip to remote Western Maryland to fish two of MD’s top rivers, the Savage and Casselman after Father’s Day. We rented a cabin in the New Germany State Park (a thirty minute drive away from the Savage through Big Run state park and just a fifteen minute drive from the Casselman). We weren’t prepared for how challenging the Savage River was (a trophy trout river). 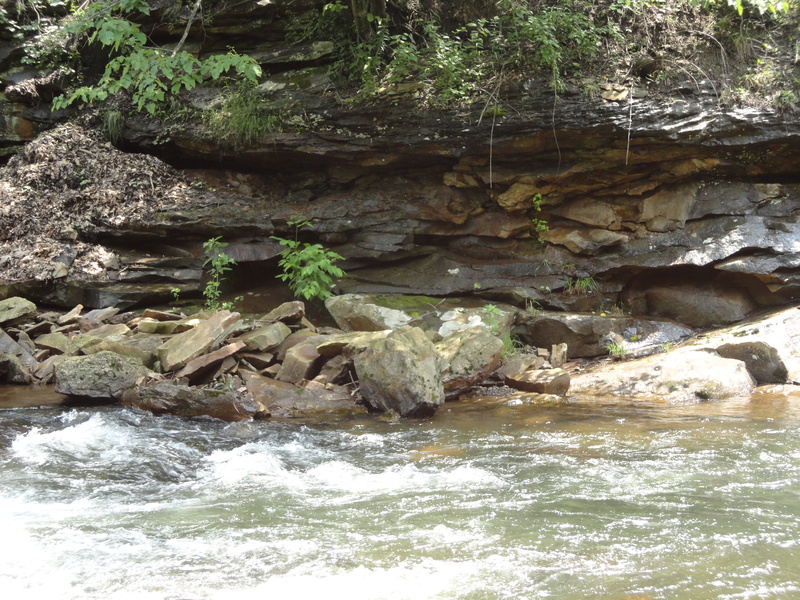 The Savage is a tailwater that runs in a steep canyon over highly “technical” wading terrain for most of its length. I’m talking boulders from the size of small cars to bowling balls, and very few to no flat areas to simply rest. Despite that, its beauty was incomparable with most days seeing a slight mist over the water, incredibly diverse hatches (spotted my first green drake and lime sally), and wildlife. With some guidance from Mike of Savage River Outfitters we set out to experience the river. 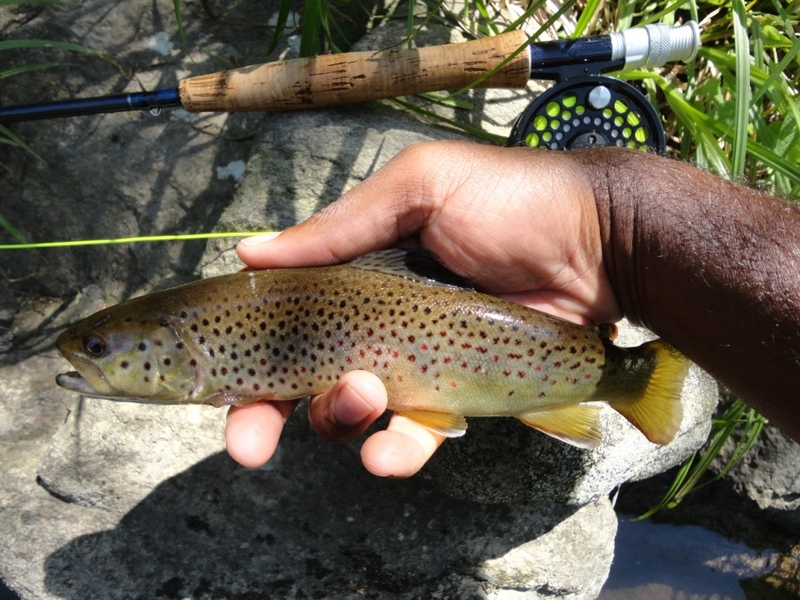 On day one, a #14 blue quill landed a 14″ rainbow, and similar-sized wild brown. My butterfingers caused me to drop both back (and lose my fly!) before I could get a good picture, but at least they were in the net! 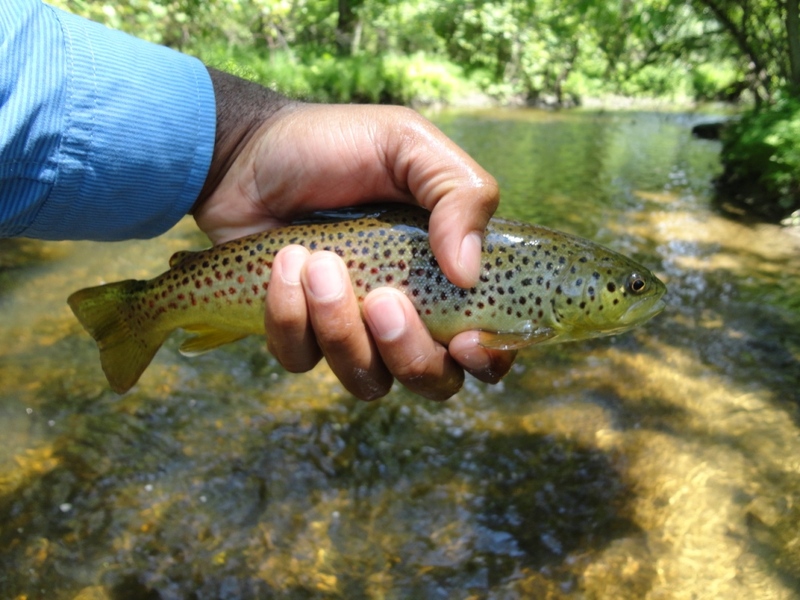 The next day–a lonnngg day of tough fishing, produced a small brookie on a nymph and then a gorgeous 12″ brook (which I also butterfingered) on a sulphur in the evening. My brother was less fortunate being skunked on both days, despite some very patient angling. He even had a 20-incher rise to a streamer, but missed the hookset. I was really feeling for him, but steaks on the grill, a beer in hand and the coziness of the cabin helped a great deal. On the evening of the first day we were also witness to a rare event…driving along Savage River road I spotted a mountain lion climbing the embankment about 200 yds in front of us. At first I thought, oh–someone is walking their golden retriever, then I was thinking–why is that golden retriever climbing the side of the mt–and then I saw that beautiful long puma tail. It was on my mind for the rest of the trip. Apparently–some folk don’t believe cougars are in MD, but I happily beg to differ. 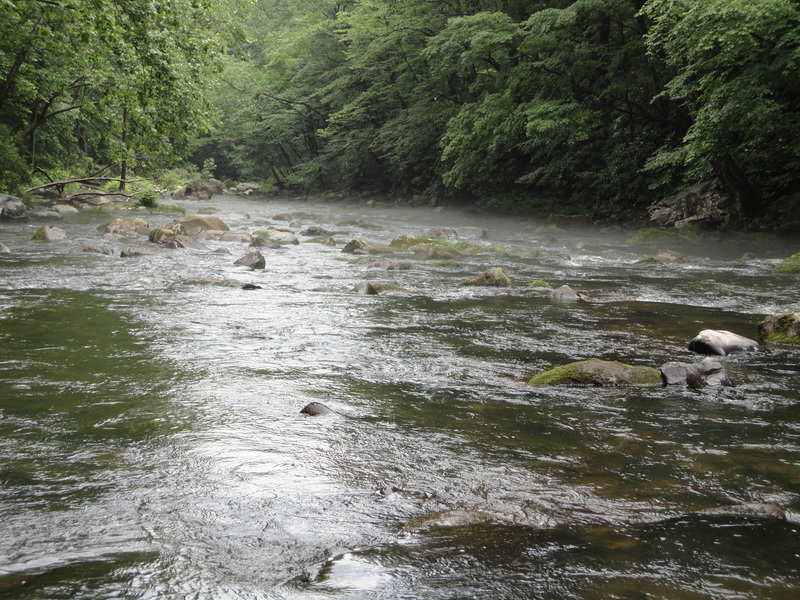 We had intended to fish the North Branch of the Potomac and the Casselman each day but rain blew it out on the first two days. On the day we were to leave, we got in a half-day of fishing on the scenic and very graceful Casselman, which sits on farmland in the heart of Amish country. 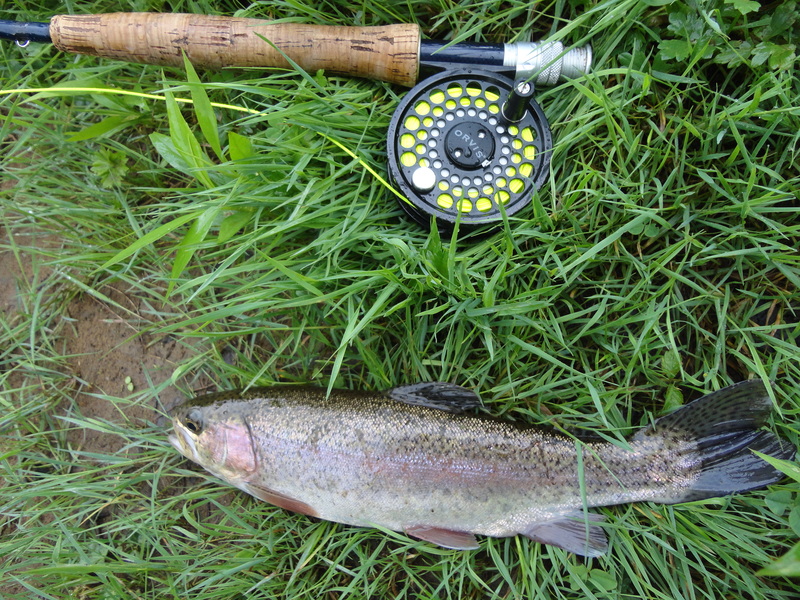 After a slow drive past Amish farmers, we hit the river early and were rewarded for throwing Caddis and a slow retrieve making it look like an emerger… I immediately hooked up (and again and again) and looked at my brother sympathetically. Uh-oh, not again! 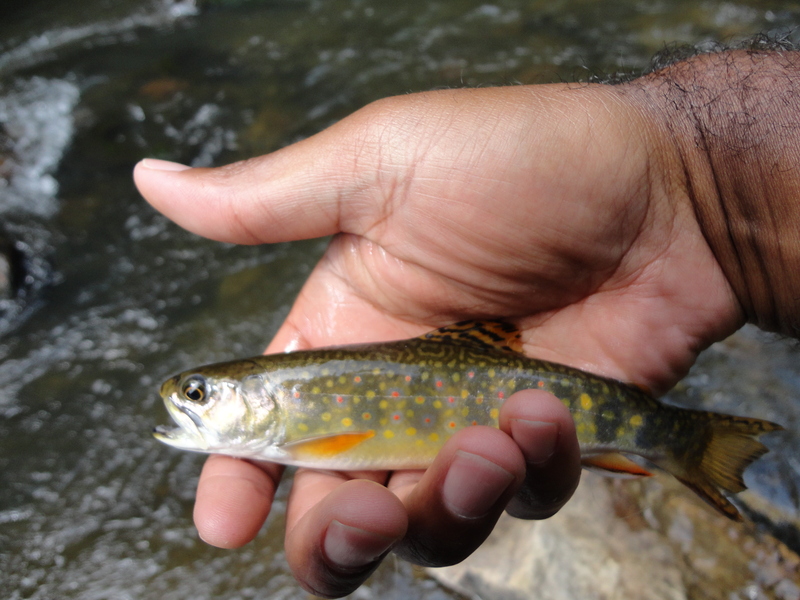 I backed off the river, pointed him to the hole and then he hooked up (again and again) and he even caught the day’s lone brookie, a 12-incher at least. The Casselman isn’t a tailwater and we regretted not taking a few trout home for supper, but we hear there are occasional summer holdovers. All in all–it was a great trip! Stinky waders, sore feet and backs, lots of grilled meat and flies to fish. Next time we’ll do a little more research and reserve the technical rivers for a half day instead of two–but we learned so much. I’m certain we became better anglers for it! Today, I moderated a panel on the film genre known as Branded Documentary at SilverDocs, the international documentary festival in Washington, DC. We discussed films made by companies to promote their values, be it in “cause” or social responsibility, or just to bring their brand to life in an entertaining way. The purpose of a branded doc is to tell the brand story using the authentic form of documentary, which is based on interviewing, investigation and story-telling. It occurred to me that the explosion of fly fishing films, some independent, and some sponsored by Simms, Scott and other well-regarded companies are taking full advantage of this exciting genre in a highly competitive environment. They blur the line between long-form commercial, branded content, and documentary. The films speak to the heritage of the brands, and of course the fishing. In some cases, the branded docs are environmental films sponsored by multiple brands invested in cold, clear, clean water and the preservation of our fisheries and waterways. Of course, we all grew up watching branded docs–remember Mutual of Omaha’s Wild Kingdom? That and Marty Stouffer’s Wild America (non-commercial) first filled my heart with the longing to become a naturalist. Thanks to Trout Unlimited, I came across a new short branded doc (long-form commissioned commercial, basically) today by the fly rod maker Scott, and the filmmakers at Felt Sole Media. This should really be in the Film Craft section of the blog, but ‘meh, its my blog and I can put it where I want it…enjoy. “Well,” I say after a moment, “I need it. I can’t explain it, I just do.” And I’ll add that though I live here in Brooklyn, I was born in the woods of New Hampshire, grew up in the fields of Ohio on the Cuyahoga, and went to high school on a sandbar on the Atlantic. Though I’ve lived in Chicago, Philadelphia, London and now New York, I’ve got water in my veins. I need to be on or near a body of water or I’m afraid I’ll just dry-up and blow away. Fortunately, I live a stones throw from some of the greatest fisheries in the world, the Catskills, the reservoirs of Westchester, Long Island Sound. We took that little ‘bow–caught on a worm, right home and fried him up. I think all my brothers and sisters got a taste. From there I was hooked. When my parents had trouble making ends meet, and there wasn’t food on the table, my Dad went fishing. We ignored the peril and fished Lake Erie for walleye, perch and bass. Oh walleye, the best tasting fish on Earth, is even sweeter knowing it “was caught, not bought.” Once or twice even, Pop came home with duck, the victim of a poor shot who made it into open water only to find it didn’t have the strength to fly. There were feathers floating around the place for days. Fishing was so much more than fishing, it was father-son-brother time. Even when we left rural Ohio and moved into the ghettos of Cleveland, we continued to get out on the water as often as possible, roaming over the breakers in search of smallies and rock bass. If we came home with just a couple perch, everyone knew who would get it–my Mom was a bonafied perch fiend. Perch was an offering to the Queen of our household. Later, it was crabbing in the Great Egg Harbor during high school and surf-fishing for fluke off the beaches of Ocean City, NJ that filled my weekends and mornings before school. 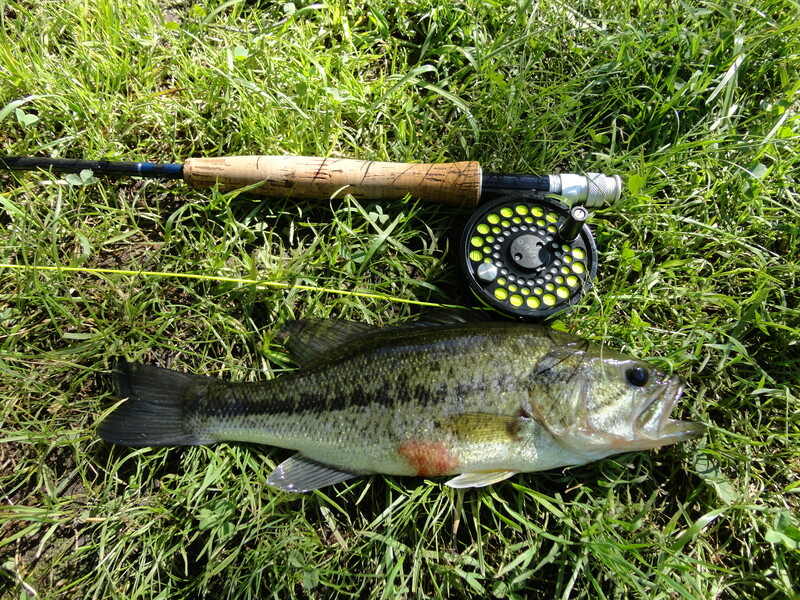 After college, I put the rods away… Life called and I busied myself with a career. Fishing drifted away for years while I made my way in the world. 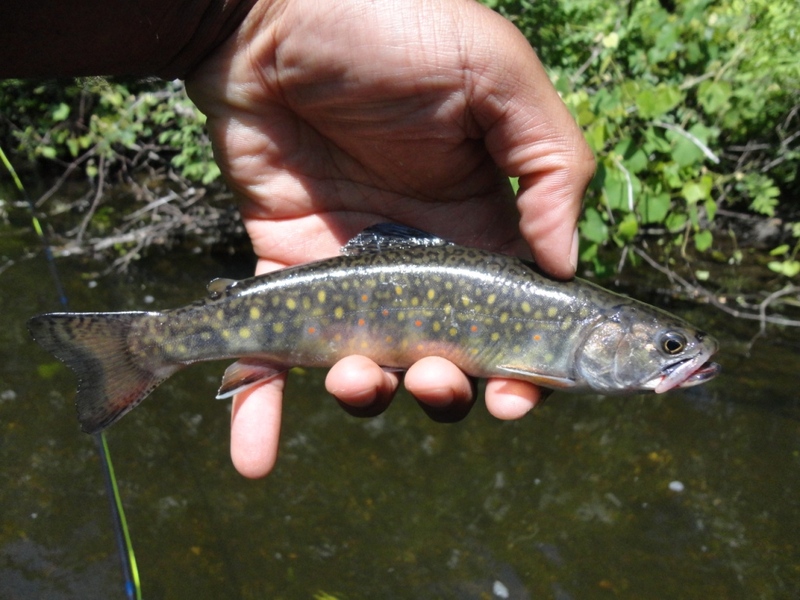 Though every time I saw a river or a lake, I wondered what was in there… brook trout, bass, pike? A few years ago, I found myself needing to reclaim some of that precious father-son-brother time and I declared a “guys-only” fishing trip on Lake Anna in Virginia. Man were we rusty! Chugging along spooking everything for miles. We were ecstatic after we pulled in a tiny perch and then some cats. Used to be we could fill a stringer in an hours worth of fishing, but damn we were happy. On that pontoon boat with my brothers laughing and calling each other nicknames I hadn’t heard in twenty years, we remembered our time on Shadow Lake, the awe and smiles around that first ‘bow, the first fish I ever caught in my life. We remembered why we fish, for the communion, to be brothers of the angle once more, to be men in a world claimed by mobile phones and play-dates, simply–to be. I’m glad I picked-up the rod once more and now, it’ll never leave my hands again. 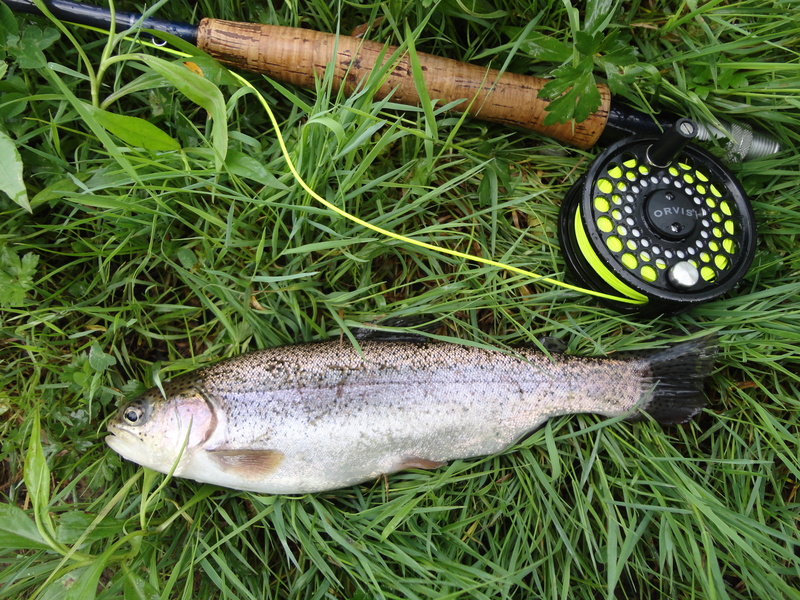 Recently, I’ve begun to learn to fly fish and thank God I’m old enough to appreciate it. This is a sport for someone who has lived in the world, who’s been there and back again. This is a sport for a native angler. As soon as I told my younger brother what I was up too, he was in. Turns out he’s not too far from a mid-life crisis either. With classes from the Wulff School and Orvis under our belt, we’re wise enough to have picked the basics up quickly, though we recognize and take joy in the fact that it’ll be a life time of learning. The familiar rhythm of the water, the sixth sense that there’s a nice brown waiting behind that rock just past that seam, dormant feelings re-awakening. Fishing is a forgiving sport, and once again, we’re in our stride. Only, we’re lucky enough to have the means to travel to the great waters now. In my mind though, Shadow Lake lingers, the smell of my father’s aftershave, the pulsing life of the rainbow in my hand. 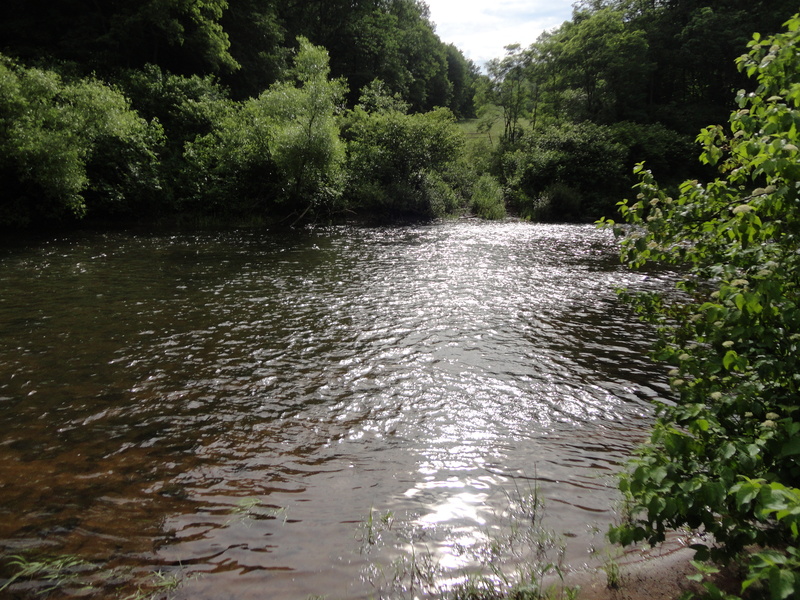 And though I blog often now about my fishing trips, to the Beaverkill, the ‘Hooch, the first fishing trip of my life will always be the best. Funny things happen as you grow older. You need the experiences of youth to mean more, the memories to be truer, and the places that made your youth special to remain unspoiled. On a recent trip back to Ohio, I was saddened to see the fields and streams I ran through as a boy, dozed flat for suburban cookie-cutter communities. 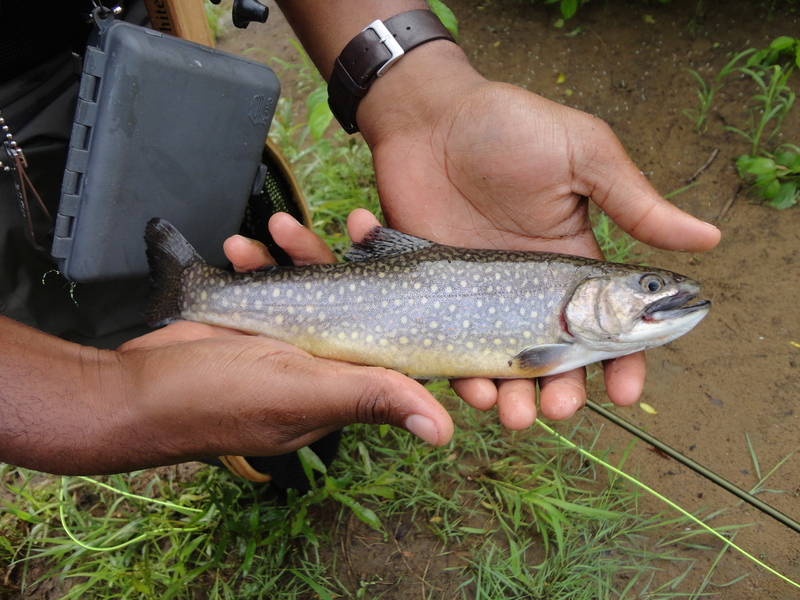 On the other hand, the Cuyahoga river, once polluted, has been restored and is an amazing fishery. 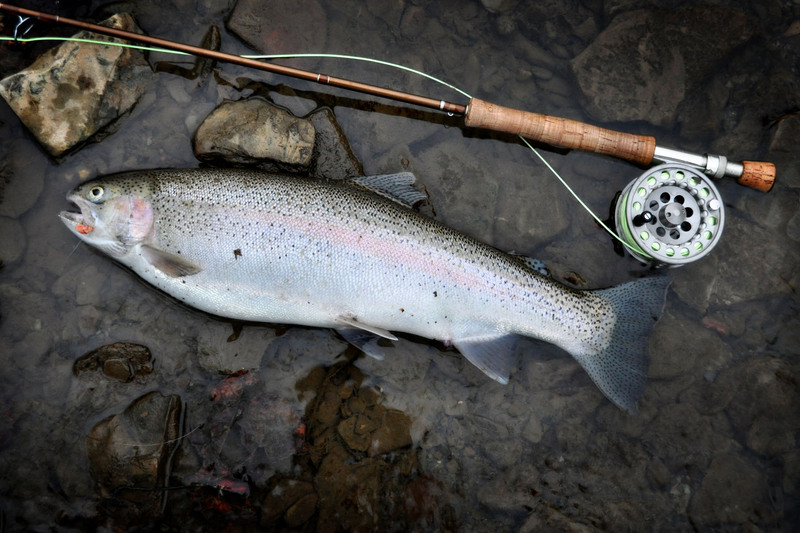 They even say that steelhead have returned to the upper river. Shadow Lake remains untouched, though it seemed a lot smaller now, a pond really. I see now that my job is to make sure the next generation has clean, cold water to fish in–that my father has passed on a legacy. That’s why I am a member of Trout Unlimited, Stripers Forever and the Sierra Club doing my part to conserve our waterways and environment. Its up to us now, and believe me, there’s a father’s son out there waiting to have his first best fishing trip ever, too. NOTE: Special thanks to The Outdoor Blogger Network and Trout Unlimited for the special opportunity to write about my best fishing trip. On a rather dreary Saturday, the wife and I decided to have lunch at the Brooklyn Flea in our neighborhood. She had the papusas (taste like a tamale to me. 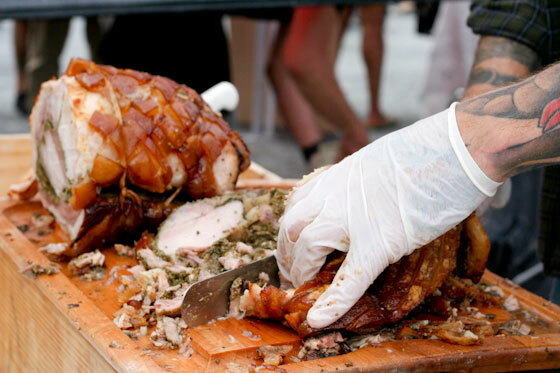 I went for the pork shoulder sandwich from Porchetta. Cause I was there just as they opened, I got a sandwich with the crispy porky cracklins mixed in. Oh yeah. 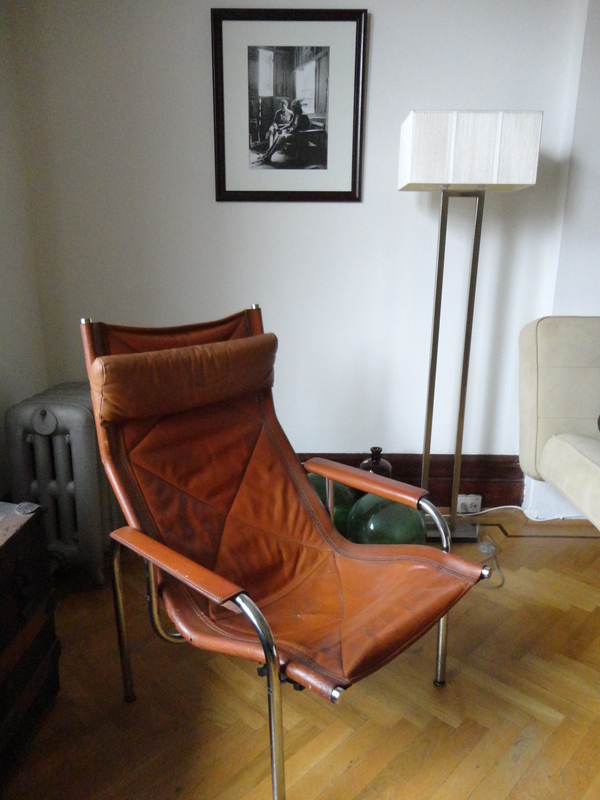 While munching we came across this cool cognac-colored leather recliner by the furniture-maker Stendig (a Knoll competitor and contemporary). Stendig is perhaps famously known for their 1966 commission of Massimo Vignelli’s now iconic calendar, still in production today. Ludwig Mies Van der Rohe, Robert Haussman, and Marcel Breuer have also created work for Stendig (Charles Stendig was an American importer of chairs and furniture). Stendig was never a manufacturer, but imported mostly from Italy, and also from Findland, Denmark, Sweden and Switzerland. He’s been criticized as never designing, but his “curation” was pretty impeccable. Familiar with the iconic “Bubble” chair by Eero Aarnio (the hanging clear acrylic chair–Stendig’s pick). 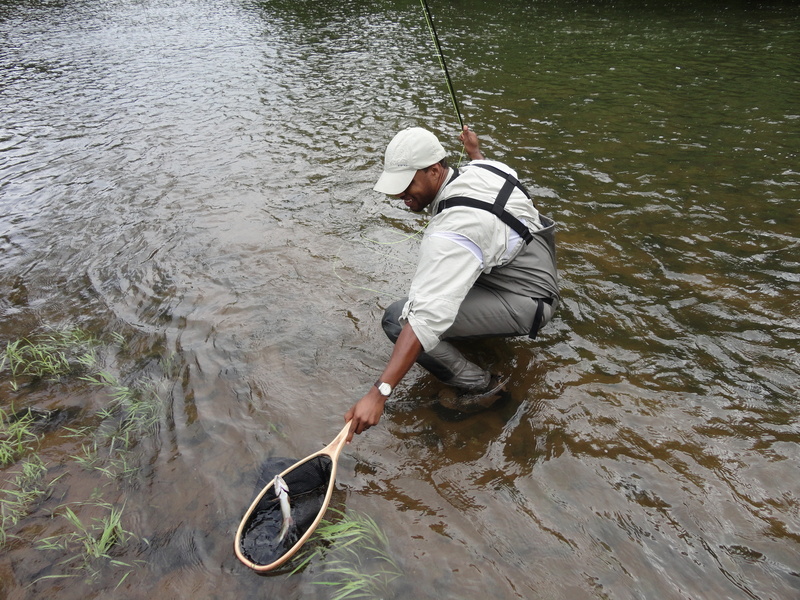 But I also have added some Eastern Water flies with the guidance of the Croton Trout Unlimited guys. 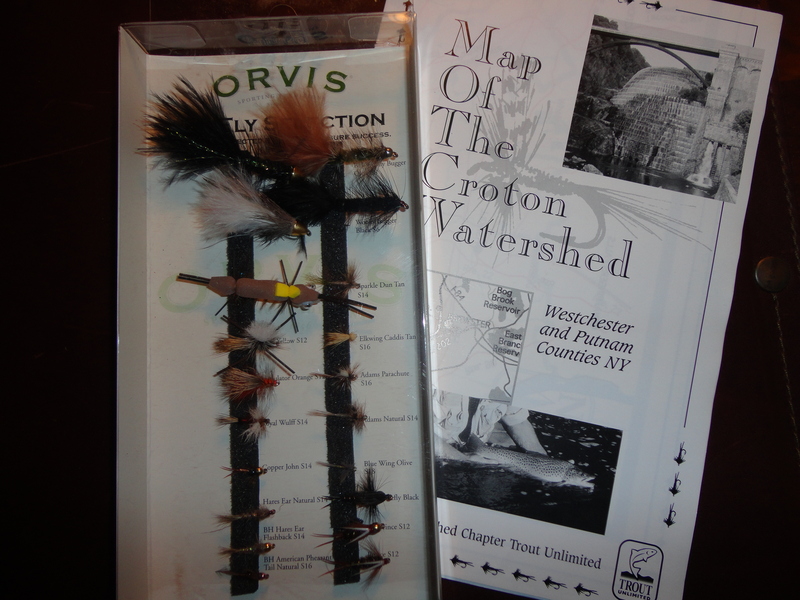 their pamphlet, “Fly Fishing the Croton Watershed” has become my go-to source. 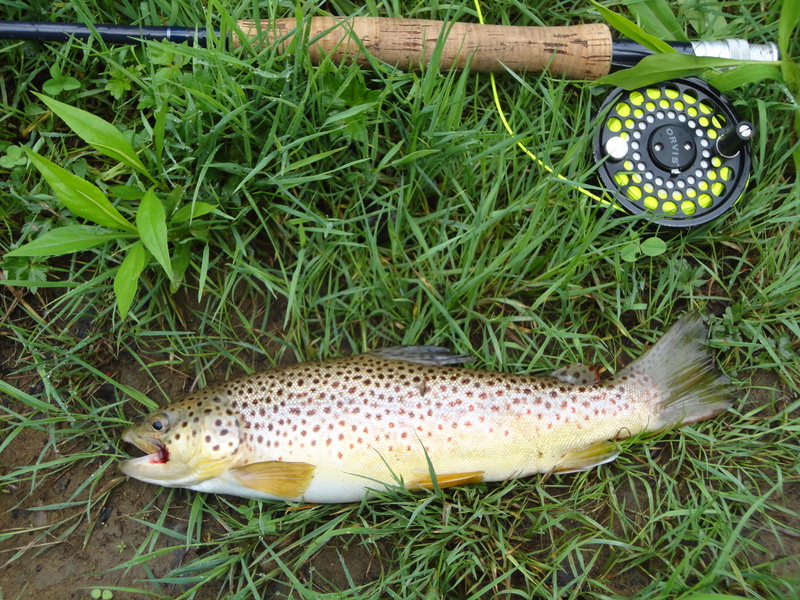 Yesterday, the Orvis 20 Fly Selection arrived…oh baby. Last weekend I fished the catch and release section of the Cross River with good results on the Parachute Adams and an olive bugger. This is for one of my fellow Gowanus Noodlers (you know who you are), who is enchanted by the idea of catching stripers on the fly after doing the party boat thing for years. Peter Laurelli has got real cahones, nerves of steel, and I’d guess infinite patience. His work has been featured on many fly fishing blogs, but since I gather you don’t read them, I’d provide it for you. I don’t know what possessed him to film his exploits fly casting to stripers in NY’s waters, but bless him. Enjoy. Thanks to Brooklyn Urban Anglers Association for the find. I can personally attest that the direct action I took as part of the SF campaign to end North Carolina’s wasteful discard rules had some results. My email and hundreds of others were answered by the NCDMF, but I wouldn’t have known to get involved without SF’s vigilance. Fortunately, several journalists were alerted and wrote about the issue as well. I recently read about the tragic discard of Striped Bass in NC waters. The story itself contains a link to a YouTube video showing pictures of the dead floating stripers as commercial fisherman attempt to achieve a limit by culling high-grade fish. I’ve also read how you and your team actually take the time to grapple with these issues (I admire that your team chose to temporarily close the speckled trout fishery just-in-case) and work with your community. As a member of Stripers Forever, I agree that “Stripers are worth considerably more per pound if allocated to the recreational fishery in North Carolina than when taken by commercial harvest.” I hope that you and your team will use the power of your office to work with your local community to keep this from happening in the future. As you know, what you do in the NC fishery has a profound impact on the entire NE fishery for stripers. You’re pioneers on the front line and your actions could affect striper fishermen (both recreational and commercial) everywhere for the better or worse. I hope that you will enter this into your official comments of whatever research or community outreach your office intends to do. Good luck and thanks for doing the hard work. I am writing in response to your e-mail regarding your concerns about North Carolina’s striped bass fishery. On Jan. 21, the N.C. Division of Marine Fisheries implemented regulatory changes to address discards of striped bass in the commercial trawl fishery. 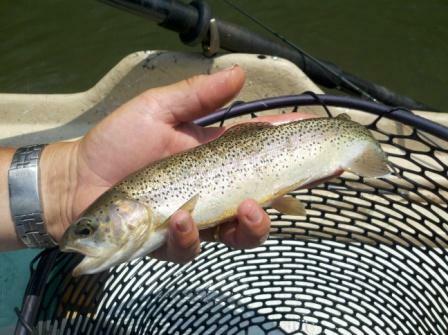 The division replaced the previous 50-fish-per-day commercial trip limit with a 2,000-pound-per-day trip limit. To avoid regulatory discards, the new regulations allow commercial trawl fishermen to transfer trip limits to other fishing vessels that hold a striped bass ocean fishing permit for the commercial trawl fishery. This way, all the fish will be landed and count against the commercial quota. Thank you for your interest in North Carolina’s marine fisheries. Membership to Stripers Forever is free, there are no dues, so consider it. Six years ago I started writing a novel about the attack on Harper’s Ferry. 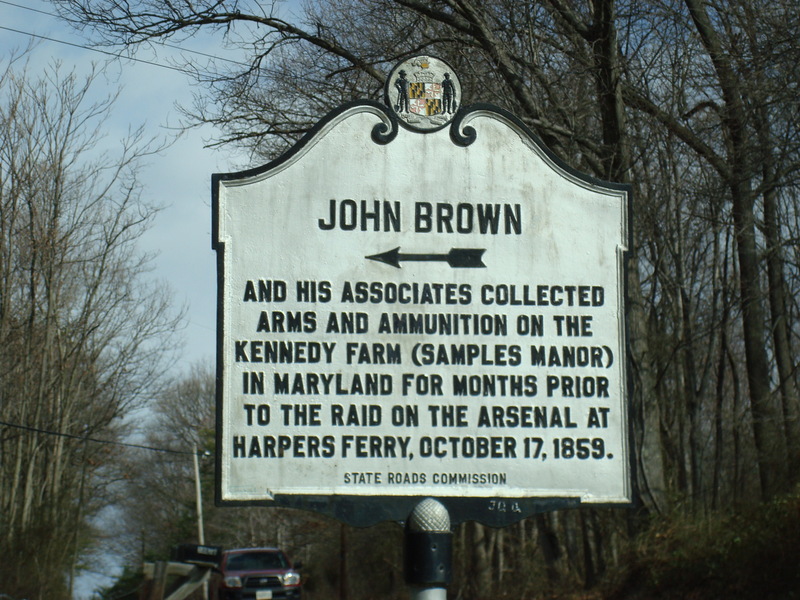 During my research, the concept shifted from a focus on John Brown, the leader of the raid to run slaves off into the Alleghenies, to his co-conspirator, a fugitive slave, “Emperor” Shields Green. I’ve read now, perhaps, a dozen books about the period, including David Reynold’s John Brown, Abolitionist, the Man who Killed Slavery, the papers of Frederick Douglass about Brown, accounts of the time by many journalists, authors, and leading thinkers, including W.E.B. Dubois and James Redpath. I have even read the account from one of the black raiders himself, A Voice from Harper’s Ferry, by Osborne Anderson. Needless to say, I’ve absorbed the story and the history. I can provide you with needless details and sit down with any Brown scholar and debate–why didn’t Brown leave before Lee’s army mustered? Why did he lock himself in an arsenal with no means of egress? Why did Frederick Douglass choose NOT to participate in the raid, when his valet Shields Green chose too? I’ve visited Harper’s Ferry, walked its streets and traced history’s footsteps on the grounds (or what’s left of it). I’ve even meditated inside the actual arsenal. My concept has shifted from novel, to play, to screenplay and back to novel again. All this to say, I’ll never be more ready to write this book than I am now. I even have the luxury of time as I’m no longer at my agency. Is there anything holding me back? No, not yet. I’ve re-engaged with the novel after a year away and plan to quite literally “pay” myself to write five days a week for the next six months. All I need know, is the discipline to write. Recently, I’ve realized that I need to be doing my one true passion, writing. More than that, I need to put it before other things, and invest in it the same way I’ve invested in my other professional career. I need to assemble the tools, and the right talent and mentors around me. And I need to confront the demon that has chased me all my adult life. It has so many names and faces I’ve lost count, and yet, there it is, always lurking under the surface, behind the mask, a real motherfucking trickster god. I’ve come to know this trickster god more intimately through Steven Pressfield’s book, Do the Work, which lays out a clear plan to beat the enemy of creation, what Pressfield names Resistance. The book was a gift from a dear friend who has shared an uncannily similar path in life; top education, jobs in the arts and theater, writing, then meteoric rises (and falls) in business and advertising. I could say its because we’re both hardworking, talented and gifted, but its far simpler than that. Writers are chameleons, capable of turning on the charm, smart–too smart, adaptable and we therefore we love change. Its because we get bored easily and we need to morph–so we invent, re-invent, and we tell stories. In many ways, change is a sometimes form of Resistance, another face of the trickster god. Because when you’re writing, or creating anything, the one thing you don’t need is change. True, you need change to form new habits, but then later you need routine. You need the safety of repetitive action, to gain real ground. Yes, I know that Resistance lives within me. That I contain both the potential for action and negation. Certainly, the subjects of my book, all were familiar with Resistance. Spurned on by a Calvinist fire and brimstone God, John Brown battled it his whole life as it took the form of bankruptcy, the death of four children, hardship, a price on his head. Shields Green had to battle Resistance to escape to the North from Charleston, SC. Given all that, my task seems simple, right? Years ago while living between Philly and NY, just back from a gloriously productive year in London, I was sitting on three excellent plays (two full-lengths and a short) that were easily producible. I had good luck in London, with all of them getting multiple readings–but then back in the US, nothing, a drought of attention. I think I still regret leaving London too early. Nonetheless, I started focusing on getting produced when I should have continued the writing. Here Resistance was the seduction of seeing my words mouthed by actors on stage. I did take a play, Hearts and Minds, to the Cherry Lane Theater in NY, but Resistance kept me from truly pursuing it to full production, a damned delay with months of work, and no lasting outcome. The trickster strikes again! Well, years later, older, wiser, and definitely more knowledgeable about success (thank you Mr. Spike Lee, my former boss for a time), I have come to realize that nothing else matters. Zero. Nada. The game is simple. Write or die (eventually). Resistance hopes you good to your deathbed having done nothing. Therefore, all that matters is that I write. I must write, to live now, and yes, to make ends meet, but also to truly live. I must write because every word, every character turn cuts deeply into the trickster god’s hide. I must write now, because I’ve lived enough to have dangerous opinions. I must write now because finally, in all my research about Brown and the black raiders of Harper’s Ferry, in the letters of Dangerfield Newby and Jonathan Copeland to their families from the gallows, in the back story I have created that drives Emperor to choose to RETURN to the south to free his enslaved son, I have found that their voices flow through my mind, swim behind my eyes, and sing in my ears. My mentor once told me “writing is thinking.” True, but I also know, “writing is living.” Writing is proof against death, against the dark, against the void. Writing is light, life, the spark–the act of creation, the most potent force in the Universe. SO, I will write. And I will slay that motherfucking trickster god. James Prosek wrote his first book, the best-selling Trout: An Illustrated History, while he was an undergraduate at Yale. He wrote his thesis at Yale under the direction of Harold Bloom, but his subject is what interests me–17th century writer and angler Izaak Walton, author of “the Compleat Angler”, the most venerable tome on fly fishing ever written. The third most re-published book in history…right after the Bible. Its on my summer reading list. In the companion film, Prosek visits Ireland and England and follows in Walton’s footsteps. Its prosaic, not much on plot or the writing, but an interesting examination nonetheless. The cinematography and score bring the film to life. You may download Walton’s “Angler” for free here thanks to Project Gutenberg or consider owning a copy. Suitably inspired by the film, I played hooky from writing, and spent the day continuing to shake-out the Clearwater II, this time on Rye Lake in Westchester and later on the Cross River. While the mid-flex tip has been described as “forgiving” I can’t help but wonder if I need a stiffer tip. It was difficult casting in the wind on Rye, and I’m not sure it was my low skill-level. I think for stillwater and 10mph winds a heavier stiffer action is required. Moving into a cove, I hooked up with a mess of panfish on a tan woolly bugger. If there are Brown trout in Rye Lake, they may have already returned to the depths given the spike in temperature. I was hoping to hit a recommendation, Bedford Sportsman in Bedford Hills, for flies and advice, but they weren’t open…probably fishing. So I moved on to the Cross River on the 4000 acres of Ward Pound Reservation about 20 min. north. I usually fish the Cross River Reservoir for bass, but the nearby Cross River is a gorgeous freestone stream with a lot more character. It has been extremely well taken care of by the park, Croton Trout Unlimited, and the local Rock Rollers organization. 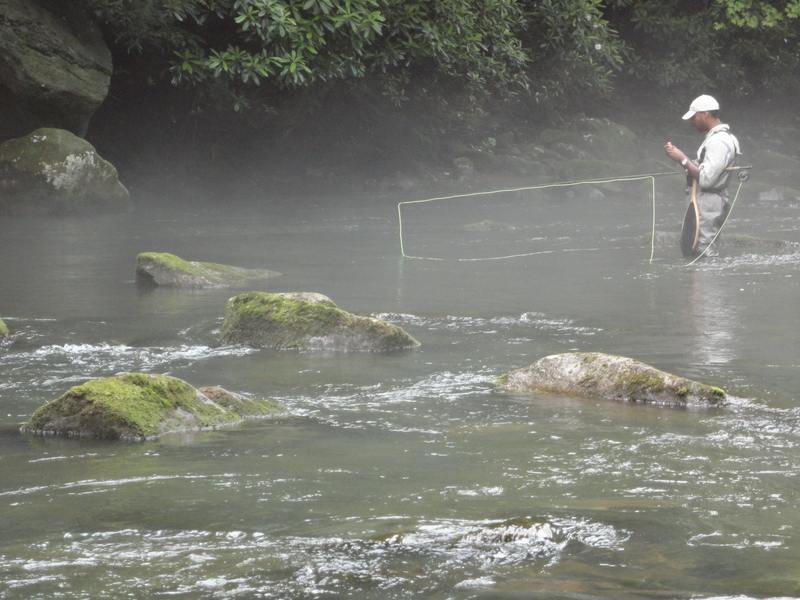 A great stream for beginners like me, there are several stretches with few obstructions for fly casting. Above Kimberly Bridge I went through about a dozen flies, wet and dry and finally a black bugger brought up a panfish-sized smallie, and then a sizable bronzeback. This king of the pool had “shoulders” and broke me off after only a 30 seconds of play. About an hour later, I was able to hookup with him again on a black ant fly. What a sight–on a fly rod–there’s nothing like it…a couple of trademark smallie jumps and several runs toward the bridge and reeds. I decided I had to wear him out. Took about 5 min. to land him, but he was gorgeous. I would have taken a picture, but the camera on my phone died yesterday–but I swear it was at least 3 lbs. He was definitely king of the pool, I observed him “bullying” other smallies and trout at times, so I consider my catching and releasing him a “gentle reminder” to be a wiser more cautious king. I think the Cross will become my favorite stream, I certainly will be taking the Gowanus Noodlers there (my fishing buddies).